You've heard of low-fat donuts? Well, these are guaranteed NO fat donuts! mmmm they look delicious, as well as the cake, for sure my stuffed animals will love them! (~_^) thanks a lot! lol... and they won't get fat! Um..... 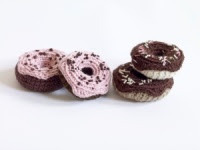 I just have a question on your doughnut amigurumis. After you ch. 12 what stitch do you sl st in to make a chain??? If you could let me know asap that would be great! Great for lil kids to play with or whatever!